Joan Lamb Ullyot is one of the ‘Pioneers of Women’s Distance Running.’ She was a youth in the 1950s and young adult in the 1960s when young women had limited opportunities in athletics. Joan started running and racing after age thirty to lose weight and improve her fitness and discovered her talent. She was coached by 1968 Olympian Ron Daws. 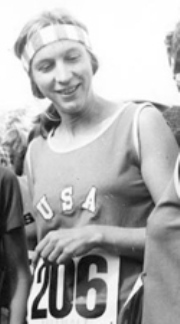 Joan was a member of the U.S. team at the first International Women’s Marathon in Waldniel, Germany in September of 1974, finishing in sixth place with her first sub-3:00 marathon. She won nine marathons including races in Kobe, Japan and Beitostolen, Norway. Joan ran her personal best marathon in winning the 1988 St. George Marathon at age 48 in 2:47:39. A master at running multiple fast marathons in a short span of time, Joan ran four marathons at age 43 in six months between 2:52 and 2:58. Victories at shorter distances include the inaugural Bloomsday 12k in Seattle, Washington (1977), the Hospital Hill Half Marathon in Kansas City (1976 and 1978), the Pikes Peak Half Marathon (1973) and the Boylston (MA) 30k (1980). Her groundbreaking 1976 book, ‘Women’s Running,’ was the first book focused on advice for female runners. 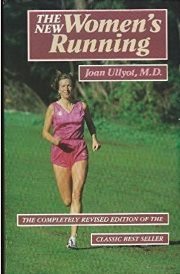 She also wrote ‘Running Free’ and ‘The New Women’s Running.’ Joan is a retired medical doctor who specialized in exercise physiology. She has two sons and resides in Scottsdale, Arizona. Joan was kind in spending an hour and twenty minutes on the telephone for this interview. GCR: For anyone under the age of 40 or 45, it is difficult to fathom the lack of opportunities that girls and women had to compete in sports until sometime in the mid-1970s. What it was like for you growing up as a teenager in the 1950s and then during your young adult years in the 1960s as far as sports and athletic opportunities? AA Girls didn’t run. I don’t know why, but they just didn’t. I grew up in the 1950s mostly and at school I was on the swim team. A lot of other girls were playing volleyball and sports like that. There was no running team for girls. There were some girls in Pennsylvania that I heard about later who were good runners but were not allowed to run competitively because they were girls. None of us ran and we weren’t particularly interested in running. GCR: You didn’t start running until well into your young adulthood. How and why did you start running? AA When I got married at age twenty-five to Dan Ullyot, who had been a 400 meter runner in high school and college, he took me to the track with him one day and I ran a quarter mile. Oh that was painful so I didn’t try to do that again. The way I got started is that I read Dr. Kenneth Cooper’s ‘Aerobics’ book and it was very good. The book finished up with instructing readers to do a one or two minute run and that was very painful for me too. It was not very interesting. GCR: After that painful introduction to running, what led you to start toward really becoming a runner? AA We moved to San Francisco when I was twenty-nine and I didn’t start running until I was thirty years old. The reason I started was because I was getting a little bit plump around the middle. Somebody said that running was good for that so a friend and I went down to Golden Gate Park which was near where I worked at UCSF Medical Center. My girlfriend and I went with our jeans and sneakers and it seemed everyone was staring at us while we jogged around the mile loop in the park. We managed it which was good. She called up her husband and said we had run a mile and he said, ‘You’re a gazelle! I told my husband I had run a mile and he said, ‘How fast?’ I felt like Ferdinand the Bull. I liked to be out in the park running along the trees smelling the flowers. When she could no longer run with me there were some men out there and I joined them and ran along to get up to a three mile run and I took off from there. I met a couple of girls from UCSF who were in their late twenties, one is Gail Rodd, and who are still good friends of mine. We started running together in the park and we were joined by other girls. We would run down to the beach and back a couple of miles every day. GCR: Since you were getting in better shape were there races that attracted you to enter? AA My first race was when I ran the Bay-to-Breakers race in 1971. It had a few thousand runners but nearly all were men. I think there were only three or four women. One was Mary Etta Boitano. Her last name now is Blanchard, but Mary Etta was just a little girl of about eight years old. She was such a good runner that she would win all of the local races for girls. She also won the Dipsea one year. But back to the Bay-to-Breakers which was a seven mile distance and I had never run more than three miles. So I ran the first three miles of the race to the base of the Hayes Street hill and then walked up the hill. Then I walked and jogged the rest of the way to the beach. Actually, it wasn’t too bad. I think I ran it in 57 or 58 minutes which was pretty decent. I didn’t know I was fast. GCR: From this longest distance of seven miles you ramped up to your first marathon two years later in 1973. Why did you start thinking about running a marathon? AA Everybody in those days who ran, all of my friends, started thinking about running marathons. One ran a five hour marathon and one ran a four fifty marathon but I couldn’t run one because I got injured and had a stress fracture in my foot. When I recovered from that I ran my first one in 3:17. GCR: What was your training like before your first marathon in 1973? AA I did a long run and I remember it because I was running with Mary Etta Boitano. I ran twenty miles with Mary Etta and Walt Stack and some others a week or two before my first marathon. Mary Etta said that if I could do that twenty-miler that the marathon is nothing because so many people are there helping you out in the marathon. In these twenty milers there is no one helping you along the way so she thought that compared to a twenty-miler a marathon was easy. Walt Stack also sponsored weekly runs and was encouraging us all. I had been at a running camp with him and some others in Colorado in 1972 and had done the Pikes Peak Marathon afterward which was only up to the top and a half marathon distance. Walt said that if you ran up to Pikes Peak that your time for that half marathon would be about your time for a regular full marathon. He was right. I went to the top in about 3:20 and my first marathon was 3:17. GCR: What was the local racing scene in San Francisco like for women at that time? AA Walt Stack was a great promoter of women in running even though there were so few of us. In local races put on by the DSE club, which is the Dolphin South End Runners, there would be about one hundred runners and only about ten were women. He would give everyone who finished a ribbon, which was nice, with the name of the race on it. The top five men and the top five women would get place ribbons, one through five, and they were very sought after. People used to criticize Walt for giving five place ribbons to men and five to women when there might only be five women in the race. Walt would always say, ‘We have to support the women because they have been discriminated against for so long.’ He was a real pioneer. He is the one who told me I should run whatever pace was comfortable in my first marathon. GCR: I definitely want to delve deeper into your racing, but first let’s talk about your books. You had some very nice success in racing over the next three years and then your first book, ‘Women’s Running,’ was published in 1976. I went back and re-read it recently and so much of it still holds true today. What led you to write the book and how do you think it stands the test of time in advising women running over four decades later? AA I think it stands the test of time extremely well. I wrote articles for Runners World and was getting lots of letters with questions that were the same ones over and over again. I got tired and my hands got sore from writing the same individual answers to these letters. I told Joe Henderson at Runners World that I should write a book since so many of the questions were the same and my answers then were also the same. He thought that was a good idea which is why I wrote the first book. When I wrote the ‘New Women’s Running’ in 1984 I reduced the weekly mileage. In the first book it was based on what we were running which was 70 miles a week being normal. For the revised edition I realized it was a bit too much for the newer runners so I reduced it to about fifty miles per week. GCR: I was in high school and college in the 1970s, we all did a lot of mileage and the depth in American running was amazing. A few years later when I ran a 2:22 marathon I was only ranked about 125th in the country while running 85 to 95 miles a week. Why was running so many miles not a big deal and so common? AA People didn’t think about it and just ran the miles. GCR: You also published a book, ‘Running Free,’ that I haven’t had a chance to read. The title reminds me of the song, ‘Born Free,’ where we are free to live our lives. It also makes me think of how when I am running in the woods on trails I have this running freedom. Will you chat a bit about that book? AA ‘Running Free’ was different. It was about my story and how I got started and how other people got started. There were profiles of various runners of different ages. Sister Marion Irvine was one. She was called ‘The Flying Nun’ and ran in the 1984 Olympic Trials and ran a 2:54 in her fifties. GCR: Let’s get back to some of your races. We talked about your first marathon where you ran 3:17, but how exciting was it to win your second marathon in Napa in late 1973? AA It was also a 3:17 which wasn’t too exciting. I won a lot of races so improving my time was the main goal. After the two 3:17s I did drop my time but then went back to another 3:17. So I was getting tired of that time. GCR: Let’s talk a bit about the First International Women’s Marathon in Waldniel, Germany in September of 1974. First, what was the level of excitement amongst the large U.S. contingent, the local citizens and the media? AA It was fabulous. I speak German so I went over as the interpreter. The first five women from the U.S. national Championships in 1974 got their race expenses paid. There were six of us on the team, including me, plus about four other Americans who ran. There were a lot of famous runners there – Christa Vahlensieck, Chantale Langlace and others. I got to interpret for everybody and also met Dr. van Aaken who became one of my best friends and mentors. GCR: Could you describe what it meant to have Dr. Ernst van Aaken, not only as your friend and mentor, but as a huge advocate for women’s running? AA We were sort of the stars in Germany in those days. We got a lot of publicity and press coverage. GCR: Could you describe your race, what led you to your improvement and your first sub-3:00 marathon and was there a point where you knew you were close to three hours and you pushed to break that time? AA It wasn’t really like that. I was trying to keep up with the other women. Everyone was running as fast as they could. The more marathons you had under your belt, the more you knew what you could do but we weren’t thinking about the time as much as we were thinking about competing. It was a very competitive race. It was nice that Judy Ikenberry and I ended up under three hours but that wasn’t the main focus. GCR: It’s interesting that you mention this because when I interviewed Stephen Sambu recently, who has won the Falmouth Road Race four straight years, we talked about his first marathon last year which was a 2:13 in Chicago. He mentioned that he was advised that in your first marathon you learn to race the distance, in your second marathon you run for time and by the third marathon you learn to race the competitors. Do you feel this held true for you? AA No, I don’t think so. The difference is that every weekend I ran DSE races in San Francisco so we were all used to running and competing and the marathon was just another race. GCR: Nowadays professional runners have few races and they work to peak for them so that is a difference. AA Yes, it is. Later on I used the Arthur Lydiard training schedule which focuses on peaking and so twice a year I would peak for a race. But in my early days I didn’t do it that way. GCR: The following year, in 1975, you raced the Boston Marathon where you placed eighth and the New York City Marathon where you placed fourth. What are some highlights of those races as far as the crowds, the courses and your performances? AA I did enjoy those races as it was great having all of those people cheering us along the way. They weren’t as big as they are now with maybe only a couple thousand runners back then. I don’t like the really big races because you get kind of lost in the crowd. The Boston Marathon was especially nice because of its history and I went to Wellesley as an undergraduate. But in those days I wasn’t interested in running or watching anyone running. I never even went to watch the race. GCR: How did you graduate then from Wellesley? I’ve run the Boston Marathon twelve times and Wellesley girls will have signs that say, ‘Kiss me, I need to graduate,’ so I helped a few of them graduate. AA (big laughter) Yes. Well good for you. There weren’t many watching in those days when I was at Wellesley, just those from a couple of the dorms near the race route. GCR: Do you remember much at all about the Boston Marathon from your time in the Boston area? GCR: In September of 1976 you returned to Waldniel to race again. How fond are you of that town and race and how was it going back to the Women’s International Marathon for a second time? GCR: A few months later you raced a big personal best time at the Culver City Marathon as your 2:51:15 placed you fourth behind Julie Brown, Diane Barrett and Leal-Ann Reinhart. What were some of the highlights of that race and what led you to such a big improvement in time? AA I had run 2:58 in Germany and had a different pace under my belt. When I first started out running 7:30 pace in races I would finish in about 3:17. Then when I got down to 7:00 minute pace that was what I needed to get near three hours. And then I just ran a little faster. So after I learned to run a bit faster in Germany I kept it up. GCR: Though you mainly raced marathons, you did step down to other distances and won Spokane, Washington’s inaugural Bloomsday 12k in 1977. How neat was it to win and to be celebrated with men’s champion Frank Shorter? AA That was a fun race. I forgot that I had won it that year because I didn’t keep track of the shorter races. I had a good time and remember jumping into the water to celebrate. I was always running shorter races because I was back in San Francisco for most of those years and running in DSE races. They ranged from three miles up to seven miles every weekend. GCR: Let’s chat about the Hospital Hill Half Marathon in Kansas City which you won in 1976 and 1978, including a big PR of 1:25. Was it competitive or did you get off the front and win fairly easily? AA I think I pretty much got off the front. I don’t remember much competition there. I just ran what I could. GCR: Did you like the half marathon distance and find it relatively easy? AA Oh yes, the half marathon was very easy. Even with the marathons I would sometimes do an easy marathon distance run one week and a faster marathon race the next week. GCR: In 1981 you won marathons in Kobe, Japan in April and in Beitostolen, Norway in May. Was it exciting to race and win two marathons in short succession in foreign countries? AA The people were very welcoming. In Japan I beat almost all of the male runners too. There weren’t many runners in Japan in those days so I was kind of setting an example for them. In Norway there was a woman I competed with who had won a prize for being the first to race to the top of a mountain during the race, but I beat her on the way down. I was a good downhill runner. I still have a beautiful piece of crystal that I was presented with for winning. I was interviewed and, when they asked me how I trained, I told them, ‘I drank beer the night before.’ They thought that was very funny. 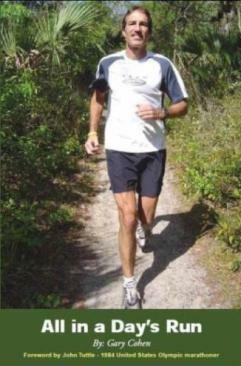 GCR: At age 43 when many runners are slowing down and racing less you had a six month stretch from November, 1983 to April, 1984 where you ran 2:58 at Marine Corps, 2:52 at California International, 2:55 at Napa Valley and 2:54 at Boston. What were the main factors that allowed you to race so well and so often at the marathon distance? AA As I say I used to run long every weekend so there wasn’t much difference. The only difference was the pace. I wasn’t very fast so I always said, ‘If you can’t go fast, go far.’ I could beat a lot of people marathoning just by being there. I ran long and just ran one week at an easy pace and the next week I pushed harder. For me the normal pace in those days was about 7:30 per mile on my long runs so I would improve that by at least thirty seconds a mile in my races. GCR: You repeated that 2:54 from Boston again four years later at age 47. Were you near the top of your age group? AA I got my name carved in the pavement in Copley Square a few years later for winning my age division. It wasn’t for that 2:54, but for a few years later. GCR: The next year you ran your PR 2:47:39 at St. George. What were some of the highlights of that big PR at an age when others have slowed down drastically? GCR: What was the last marathon which you ran? AA It was the Boston Marathon when I was 56 years old. It was the 100th Boston Marathon so I ran that. GCR: We’ve talked about several of your races, but with all the other marathons, shorter road races or cross country events that you raced, are there any that stand out? AA I loved the races around the world in Norway and Japan and Germany. I ran an interesting race in Switzerland. After we ran the marathon in Waldniel we went to Switzerland and I ran the Sierra Montana race. Gayle Barron did that one too and she beat me pretty easily. Gayle is a very good runner. I have a cup from that race which I think was for third place and I believe Gayle got first place. We didn’t think of the races as special or something we trained for. We just ran them because they were there. We focused on one race and the others were incidental. GCR: Since you liked to really race your competitors, who were some of your favorite competitors and adversaries that were similar in talent and helped to bring out your best? AA There was a difference in the international, national and local competitions. I think my favorite competitors were the ones I raced with every week in California. One would be Gail Rodd whose husband was Flory Rodd, a great runner. She is widowed now and was a very good runner when I raced. Judy Leydig and Sue Vinella were also in the West Valley Track Club with me and we were a great bunch of runners. We won some national championships and we also won the team award at the Avon International Marathon in Paris, France. GCR: We’ve talked some about the group of women in the late 1960s and early-to-mid 1970s that are referred to as ‘Pioneers of Women’s Distance Running.’ Was there a camaraderie among you back then or has it increased even more so in recent years through keeping in touch via social media? AA When we would meet at a race like before the start of the Boston Marathon we would be waiting and have a little chat. There were a lot of wonderful women and it was just great fun. Gayle Barron was one of them. There was Miki Gorman, who was a wonderful competitor who could win everything. I wasn’t in that category because she was such a fast runner. She’s now deceased, poor thing. Kathryn Switzer was always there and knows everything about women’s running. She was a good runner and particularly important as a founder of the Avon running circuit which helped get women’s distance races into the Olympics. We got the marathon in first and then finally the 5k and 10k. I was on the International Runners Committee back then and Jacqueline Hansen was the big moving force there. The IRC got going in the 1970s and put pressure on the International Olympic Committee to add the women’s marathon to the Olympics. We eventually made it and so there were a lot of important women runners. GCR: You were in that first group of women’s marathon runners, but when that next group came along with Grete Waitz and Lorraine Moller and Joan Benoit did your group have any sense of pride that you had set the stage and that the next group could surpass you and take it to another faster level? AA No, not really. But I’ll have to tell you about when I first met Grete Waitz. My teammate, Judy Leitig, and I were at the start of the New York City Marathon and we were across from this blonde woman and her husband who were wearing Norwegian uniforms. No one knew her because she hadn’t run a marathon before. But I knew her from a European running magazine called ‘Spiridon,’ that was published by Noel Tamini in Switzerland. I had seen her picture in the magazine for setting a record at 3,000 meters, but that is pretty short. She was a wonderful runner up to 5k, but nobody knew her since she hadn’t run a marathon and she also had a high race number. When we were gathering at the start of the marathon I went up to her and said, ‘Excuse me, are you Grete Waitz?’ And she said, ‘yes.’ I said, ‘have you run any marathons before,’ and she said, ‘no, this is my first.’ I said, ‘let me give you a bit of advice.’ Imagine, me giving Grete Waitz advice. I told her, ‘It’s important to save yourself for the second half. For the first half I would just stick with someone who is very good with this.’ The World Record holder in the marathon at that time was Christa Vahlensieck and so what Grete Waitz did was to run on Christa Vahlensieck’s shoulder until about fifteen or twenty miles and then she took off. So she did exactly what I told her to do. I have to take credit. GCR: Let’s get your thoughts on some elements of training. We’ve talked about mileage a bit. What range of mileage is typically appropriate for a high school miler, college 5k and 10k runner and most effective for a post-collegiate marathon runner when building base endurance? AA My first coach was Ron Daws, from Minnesota, and then he introduced me to the Arthur Lydiard training. Ron Daws used the Lydiard method of training as, of course, did Arthur. I think for young runners fifty miles a week is right. When you get older you should work up to around a hundred miles a week. I didn’t do that – I only did around seventy miles a week. And before my best marathon I only did forty miles a week, but that was at altitude. GCR: What are your thoughts on taking care to run the right pace in training? AA When I first started running it was with friends from the medical center and the guys would always try to run too fast in training, but when it came to a race since our race pace was faster than our training pace, we would often beat them in the races. The longer the race was, the easier it was to beat them. I remember one time when three of us girls were running in Golden Gate Park some guys were running and asked if they could run with us. We said, ‘sure,’ and they ran with us for a half a mile. Then they asked if we ran any faster and when we told them that we didn’t they asked, ‘do you mind if we go ahead and leave you?’ That day we ended up running a twenty miler and we beat them all. GCR: How important is running on soft surfaces to give runners a variety of running surfaces and possibly to reduce injuries? AA I’m not sure if it reduces injuries, but personally I loved cross country running because of the change in terrain all of the time. That’s very good for the legs to have the surface change like that. I don’t mind running on asphalt which is better than concrete. Right now, at my age, I don’t really care where I run as long as I can get out there and do it. But I do think that cross country running is great with the changing terrain. What I love about running is the mental and spiritual and emotional well-being it brings. When I’m out running with friends we talk. When I’m by myself out in nature I never wear anything in my ears. I don’t like to listen to music when I’m running. I like to listen to the birds and the bees and see the flowers. GCR: You spoke earlier about running some speed work on the track and many marathon runners tend to focus their intense days on endurance sessions such as lengthy tempo runs and long repeats on the track. What is their relative importance versus shorter intervals of 400 meters or less to maintain leg turnover? AA Part of Lydiard’s training program was that we ran sprints. So I would run a mile and do sprints along the way. I’d run a hundred yards fast, a hundred yards slow, a hundred fast and a hundred slow. It’s good for your legs to do those changing tempo runs. GCR: How tricky is the balance of improvement versus injury as a runner steps up training to aim for faster race performances and what did you do in your own training to improve while minimizing the chances of injuries? AA It wasn’t really a problem for me. The person I knew for which it was a problem was Sister Marion Irvine because she would do her long runs too fast. She would get injured that way. If we ran at a reasonable pace we wouldn’t get injured. When I did my track workouts and hill runs I ran fast, but I wouldn’t do the long runs fast. AA Well, I didn’t have any little guy on my shoulder (laughing). My body knew what to do by itself. If I had to slow down then I slowed down. I didn’t have to worry so much. I think that the frequency of racing is very important and most top runners don’t do that these days. Remember that I would race almost every weekend during the time I lived in San Francisco. GCR: It’s interesting that you mentioned frequent racing because when I interviewed Benji Durden he talked about how in 1980 he ran the Boston Marathon and then he raced every weekend afterward until the Olympic Trials Marathon and how there were times where he might race fifteen or more weekends in a row. He said he would do speed work on Tuesday, a long run on Thursday and then race on the weekend and that was the core of his training. Was that similar to your training? AA That was like my program. I would do one day of speed, one long run and then the rest of the days were just at my normal seven-and-a-half minute mile pace. I raced every weekend. We didn’t have to pay much to race either. It cost a buck to run the DSE races. GCR: With the increased knowledge in recent years of the science of training to race faster and improved nutrition, is there anything you would have done differently in training or nutrition or rest and recovery that may have helped you to be more successful as a racer? Or do you think you wouldn’t have been any better? AA I don’t think I would have been any better. I was doing everything then that I would recommend now. I think that people who are coming into running now are doing some things wrong. GCR: What were some training highlights when you coached others? AA I used to Coach the Aspen Running Club for about ten years starting around 1993. They did very well and I enjoyed coaching. We would do track workouts once a week and we would have three groups. We had the turtles – the slowest group, the gazelles – the second group, and the cheetahs. If we were running 400 meters or 800 meters we would let the turtles go first and then when they got to a certain point on the track the gazelles would go and then when they reached a certain point the cheetahs would go. They aim was to have everybody finish together. It didn’t always work out that way, but it was a great way to train. We did that once a week and a long run once a week and, whenever we could, we ran a race. I think that’s a great way of training. GCR: With my own running and most others who are training strong I have noticed that we only race faster for a limited number of years. Will you explain your ‘Ten Year Rule’ of running improvement? AA Most people are only going to improve for ten years. It is one of my ‘Rules of Ten.’ Another is to not run more than ten percent of your miles fast and the third one is to not increase your weekly mileage more than ten percent. I think I was one of the first to come up with these. GCR: When you look back on your life, what have been the positive effects of the discipline and tenacity learned from running on other aspects of your life? AA That’s a very interesting question. I don’t know if I learned more from running than from my other parts of life. I grew up in Pasadena and I went to a girl’s school and then a girl’s college. I was at Wellesley like Hillary Clinton and Madeline Albright and others. That was very important. I do think that what running did was that it made me believe I could do anything – let’s put it like that. GCR: When you first began practicing medicine you were in a different specialty. After you began running, how long did it take and what was the pathway that led to you changing your specialty from pathology to exercise physiology? AA I first started my medical school education in the early 1960s and finished in 1966. I was doing research in pathology. It was very nice and that is where I began using the electron microscope. That is one reason I started running because I was getting over exposures on my slides and was trying to figure out why. Then I realized that I was timing the exposures of the slides to my pulse and that when my pulse slowed down I exposed the slides too long. When I finished my fellowship in cellular pathology I needed to look for a different field and the field I found was health. I worked with the Institute of Health Research teaching people how to run and measuring the changes that took place in their chemistry and physiology such as lower pulse rates as they were running. I didn’t start running until 1971. That was a good way to start. That’s how I became a runner and became known for my knowledge. Then when I wrote my book in 1976 there was demand to have me as a speaker. Since I was a physician I was answering questions on women’s health. I talked all around the country on the same ticket as George Sheehan and Joe Henderson. It was great fun. GCR: Now when we flash forward to today and you are in your seventies, what is your current health and fitness regimen as far as running, hiking, resistance exercises and monitoring your diet? AA The main thing I do is that I walk a lot. I run some too. I walk about half and run about half. I do a few light weights – nothing special. I can’t think of anything else I do. Mostly I still depend on running, walking and hiking. I used to bike but I got in a big accident about ten years ago and almost killed myself so I decided that biking wasn’t the right thing. GCR: My mom is in her early eighties and still walks every morning, goes to church, does yard work and paints. What dreams inspire you and goals drive you with respect to your health and personal life with your accumulated wisdom of experience and years? AA I’m glad to hear that your mother is painting because I painted a lot at one time in my life. I was studying to be an analyst and all of this material was coming up from my unconsciousness and the only thing I could do was to paint it. I think you have to learn a lot about yourself and your dreams and a good way to do that is by painting. We have a physical side and a spiritual side. And the social side of us is very important – to have friends. GCR: Speaking of the social side, we touched on social media a bit. How joyful is it to be connected via social media to so many people in the running community - runners you raced with, runners who raced during the same years whom you didn’t know and others who have joined the running community in recent years? AA I think Facebook is great. The reason I joined is that my son started working for them back in 2008 and he said, ‘Mom, you’ve got to get on Facebook.’ I asked him why and he said, ‘So that everyone can get in touch with you.’ I do like it. If you look at my Facebook page there are a lot of runners on there. I could add more, but I only do if they ask. I have a few hundred Facebook friends and at least half are running friends like Mike Fanelli and Rod Dixon. That Rod Dixon is such a character. It is wonderful being able to get in touch and stay in touch on Facebook because otherwise we wouldn’t be able to do that. GCR: During the first three decades of your life you couldn’t have imagined a life that included regular running. Now, after starting running, becoming a top marathon racer and being a runner for over four decades, can you imagine a life without running? AA No, I can’t. It must have been destiny. GCR: When you speak to groups or just have casual conversations, what are the major lessons you have learned during your life from growing up when athletic opportunities were limited for women, the discipline of running, the challenge of competing and adversity you have encountered and your philosophy of becoming your best that you share with others and would like to share with my readers? AA You have to do what you enjoy. You can’t try something else because you are pushed into it. It’s got to be what you enjoy. But you have to give yourself a bit of time because no one is going to enjoy their first hard 400 meters. You have to give yourself the opportunity and it was very important for me to have friends that I could do these things with rather than doing them alone. So, I would say find friends. Funny memory two At the running camp I attended in 1972 I remember a funny story when Peter Snell was starting to give a lecture as is done at running camps. One of the women in the group said, ‘Excuse me, but could you tell us who you are?’ He said, ‘my name is Peter Snell.’ And she said, ‘what did you do?